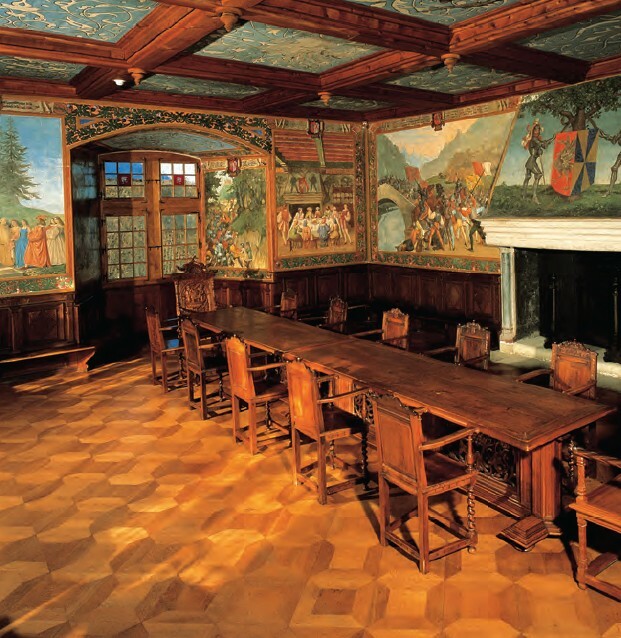 Beautiful artwork and paintings from well-known artists starting from the 15th century adorn the rooms and walls of the La Gruyeres castle of Switzerland. It takes its visitors on an art journey spread over five centuries. Places love you, want you, and keep you, if they want. How else can travelling without reason to a destination 8,100 km away be explained, standing once again face to face with a castle in Switzerland, when it was not on the itinerary. Maybe as a soul you lived there and the fascination of past life, the associations with people, courtyards, rooms, walls, the arts, and gardens beckon your soul to journey, despite being prisoner of a body in this life. We are all in captivity of a situation you never designed, and a country you don’t know why you were born in, or work in, or even die in. The castle La Gruyeres is constructed on top of a hill surrounded by dense trees. Towers and turrets, round ones, square ones, capped by similar shaped caps make it a distinctive and distinguished presence in the valley populated by villages, cheese shops, dairies, forests and long sprawling meadows at the Alpine foothills. It is never tiring to sit on a bench at La Gruyeres and look at the sunbathed vistas, cows lazily munching grass, with neck-bells indicating their movements. Such resplendent beauty; such repose; such peace in the air, such joy in ‘being’ can only be felt at a heaven-kissed piece of Earth, as this! Surprisingly, the excitement of a second time, was the same as that of the first time!! If the same level of excitement can be felt again and again, the place definitely has character! The entrance leads to a wall where visitors leave their notes, pasted on the brick-wall and short recordings on how happy they felt here. Such is the enchantment of Gruyeres that reality and imagination are fused as one! The castle was constructed between 1270-1282 AD, similar in style to the fortifications used in Savoy. AlThough it offers a peek into the eight centuries of its existence, 15th Century marked its Golden Age. In 1476 A.D., Count Louis participated in the Burgundy War along with his confederates that was followed by a transformation of the fort to a stately palace. The baroque interiors are reminder of the time when bailiffs, sent from Fribourg, lived here. It is important to recount the beginning of the House of Gruyeres. Its symbol is the Crane, Grue, in French from which it derives its name. 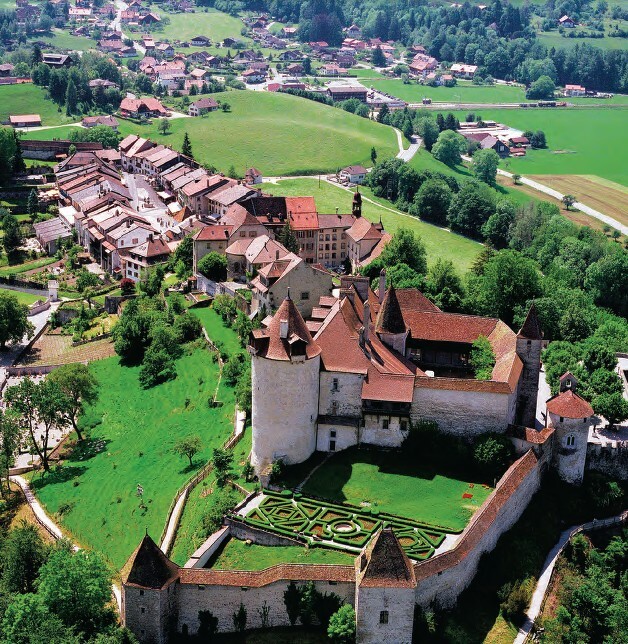 Between 11th and 16th centuries almost 19 counts resided in Gruyeres. The last, Michel, was so bankrupt in 1554 A.D. that the creditors, cantons of Fribourg and Bern, shared his Earldom. The castle was residence to bailiffs from 1555-1798 A.D. and then of the prefects sent by Fribourg. In 1849 A.D., the Bovy and Balland families bought it and used it as their summer residence, restoring it through painters. The canton of Fribourg bought it back in 1938 and converted it into a museum opening it to public. 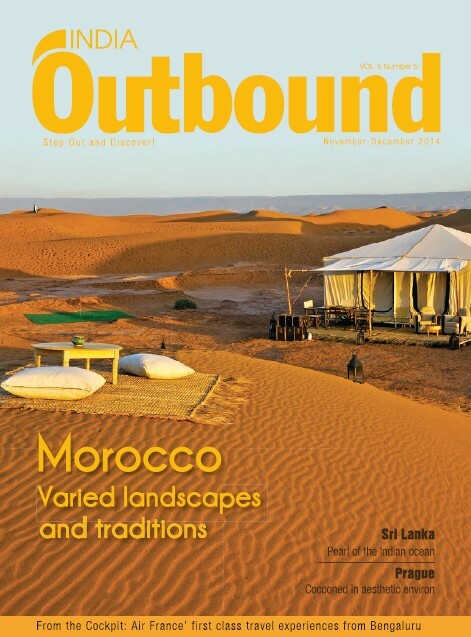 A foundation now looks after its conservation and administration. It has several romantic landscapes painted in the mid-19th century by artists such as JB Camille, Corot and Barthelemy Menn. Esplanade, a part of fortification, was planned by Count Francois I (1433-1475 A.D.) and carried on by son Louis (1475-1492 A.D.). 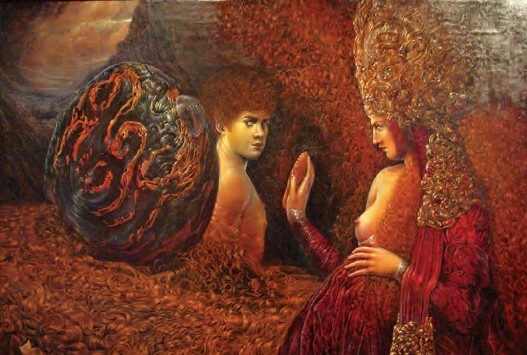 The bronze shields of Mars (1997) and Venus (1999) were done by Patrick Woodroffe, an English artist of the 20th century. Ahead in the courtyard, the tower with the staircase bears the arms of Guyers–Seyssel. The wall decorations were painted by Francis Furet roughly in 1900 A.D. The shepherdess Belle Luce, can be seen in one of the hunting scenes. The kitchen has a big fireplace with pot hangers, skewers and a sandstone oven. Feeding a castle every day must have been an onerous responsibility! Guard room and armoury housed the men and their ammunition. It is disturbing to see that a beautiful place such as this could also be locale to blaring cannons and gunfire. The spiral staircase is an important addition by Louis and the wall painting: ‘Crucifixion’ from 1685 A.D, appears faded, unlike its inscription “Cr VX MVn Dum LVXit (The cross will flood and light the world) that beams. The two floors of the Castle are filled with interconnected rooms. In the Burgundian Room are the three capes of Golden Fleece Order, the war booty captured in the Battle of Morat against Charles the Bold, Duke of Burgundy in June 1476 A.D. The black velvet capes were meant to be worn in sacerdotal mourning and hence considered as important war booty. The bailiffs’ room is historical reminder of the fact that between 1555 and 1798’A.D, 50 bailiffs used this room as their study. Paintings dating back to 1685-1686 A.D. by Master Cuen decorate the walls—frieze of bestiary is enriched with the heraldic Crane, arms of the city of Fribourg and some 16 century graffiti. Plague had devastated the region in 1670 A.D. bringing out the role of statue of Saint Sebastian as protector. The stained glass windows bear the arms of the rest of the bailiffs over the centuries— Ulrich von Englisberg (1563), Pierre de Praroman and Elisbeth d’ Affry (1580) and Atoine Python (1653) among others. The room with joi de’ vivre is Corot’s room that captures the creative upsurge around 1852 A.D., when Daniel Bovy asked his friend painters to decorate the 18th century panels. Medallion landscapes were done by Barthelemy Mann and by H. Saltzmann, with strokes from Corot and Menn. Allegorical females and jesters above the mirror were done by H. Baron and flowers and fruit garlands by F. Furet. Bust of Sissi (Empress Elizabeth of Austria), 1867 A.D. is the work of Marcello (Adele d’Affry, Duchess Castiglione Colonna). The room of the counts is of the last count. The arms of Jean 1st (1500-1514 A.D.) and wife Huguette de Menton are on the large gothic dresser. Fleur–de-lis and Savoyard Cross are also beautifully rendered on the stained glass along with Gruyeres priest’s illegitimate son and the Castella family. Tapestries are Flemish and an interesting representation is the wooing of Delilah by Samson. Surely, this is a celebrated room! Next is the room with the legend of beautiful Lucy, a woman of a simple origins and loved by Count Jean II (1514-1539 A.D.). This room is dedicated to her. Above her dainty bed is the tapestry of Alexander’s victory (1700 A.D). Another, above the fireplace is of Ulysses meeting Hector at Troy (1600 A.D). How could a castle of such magnificent life be bereft of the strains of music? In the Music Room one finds Pianoforte by J.W. Braschoss (Geneva) made for Franz Liszt (1835 A.D.). Rustic paintings in Furet’s Room by Francis Furet (1842-1919 A.D.), bird-catcher’s equipment in the hunting room; heraldic stained glass windows in the baroque room; and the wall decorations of the knight’s room (1852-1862 A.D.) make the Castle throb with the life of yesteryears. Sometimes, it is the sound of battle armours, sometimes the soft notes of the piano, sometimes the whispers of Lucy, and at times the voices of creative satisfaction of painters and artisans, that one hears at La Gruyeres. The Chapel of St. John dates back to the 13th Century that Count Louis had it renovated in 1480 A.D. The grand stained glass celebrates here the Baptism of Christ. The Altarpiece dates to 1530 A.D. and wooden sculptures: Pieta and Mary Magdalene, dates to the second half of 15th Century. A beautifully laid garden can be seen from the window that dates back to 15th Century that must have seen many a season since then. The ‘Crane’ of La Gruyeres sits 830m above sea level and has kept the flag flying high through its eight centuries of existence. 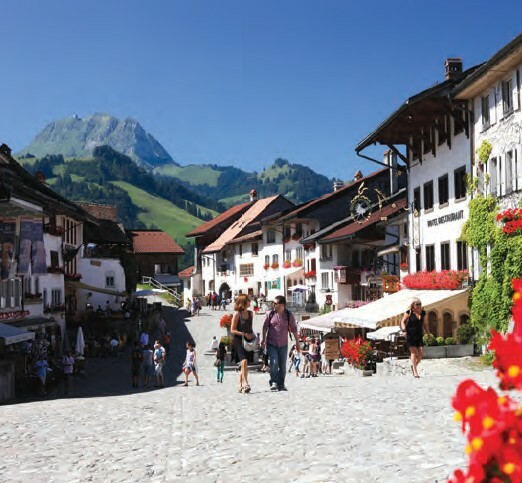 It is difficult to leave a beautiful place such as this unless there is something as appealing as the freshly made cheese from the cheese factory in the town below!